This entry was posted in HU and tagged újság on January 29, 2012 by FEMEN. 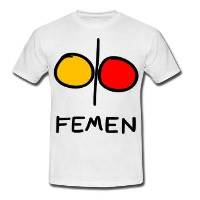 This entry was posted in HU and tagged újság on January 28, 2012 by FEMEN. This entry was posted in HU and tagged újság on December 21, 2011 by FEMEN. This entry was posted in HU and tagged újság on December 19, 2011 by FEMEN. This entry was posted in HU and tagged újság on December 7, 2011 by FEMEN.